Barton offers a range of fixed and removable eyebolt systems where access from inside a building is needed to carry out external work, such as window cleaning or maintenance. Our solutions are designed to make fall protection easy to specify but also aesthetically pleasing. The Latchways PushLock and SafeRing VP can be fixed into walls, floors or ceilings providing an internal fixed anchor to which workers can confidently attach a lanyard and safety harness while performing their duties. Eyebolts and their fixings need to be able to withstand the loads generated when a fall is arrested. While conventional eyebolts meet the safety need, the lack of aesthetic consideration can impair the visual characteristics of the building where they are installed. With Latchways PushLock and SafeRing VP, specifiers have the opportunity to choose a discreet window safety system without compromising the clean lines of interior design. 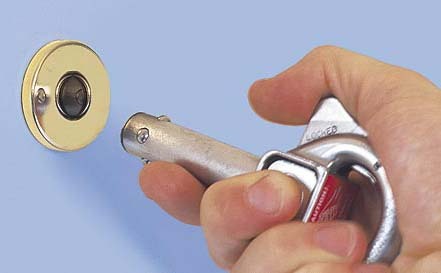 The PushLock and SafeRing VP eyebolt systems are suitable for installing into a range of materials. All elements of PushLock and SafeRing VP eyebolt systems comply with the relevant standards and have the appropriate CE marking. The key standard is EN 5845, which relates to permanent anchors for industrial safety belts and harnesses.